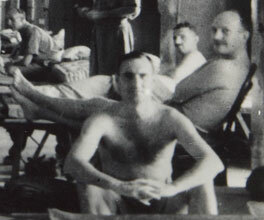 When the Japanese captured Singapore in February 1942, many Australian troops were suddenly prisoners of war. Some 50,000 went into the prison camp known as Changi, in central Singapore. Despite the overcrowding and lack of food, conditions in Changi, and the chances of survival for prisoners, were better than in other camps. The Japanese needed prisoners to work on a railway they were building between Thailand and Burma in 1942-1943. Camps built to house these workers along the route were some of the worst in the war. It is estimated that 16,000 Allied prisoners died as a result of starvation, exhaustion and violence on the railway. Even more civilian labourers, conscripted from the conquered populations in China, Burma, Thailand, Malaysia and Indonesia, were worked to death: the estimate is 90,000. One man who did much to improve the survival rate of prisoners was the Australian Army doctor Major Arthur Moon. Moon was captured in Java when he refused to abandon his patients. For the rest of the war, he was moved to many different work camps in Thailand, but stayed longest in the Tamuang camp, near the Bangkok end of the railway. Conditions in these camps were atrocious. The men suffered from severe malnutrition, often eating only a few handfuls of rice a day. They had to perform hard physical labour in this weakened condition. Their resistance to illness was reduced and they suffered severe tropical diseases such as malaria and dysentery. Many also suffered from tropical ulcers, in which micro-organisms invade small cuts and abrasions and eat through the flesh, down to and including the bone. Major Moon had to improvise medical treatments and equipment from whatever he could find. Operations and blood transfusions, which are normally only conducted under the most sterile conditions, had to be carried out in open, dirt-floored huts without even running water. I owe Arthur Moon my life and possibly my foot or leg. But there was more to it than medical skill. I do remember the kindness, the compassion, and most of all that he believed in me, something that brings its own comfort in a degraded life. The railway built by the Japanese between Bangkok in Thailandand Rangoon in Burma (Myanmar) is 415 kilometres long. Because of the many who died in building it, it is often referred to as the ‘Death Railway’. It is no longer in use today. Large parts of it are now underwater because of flooding due to the construction of dams. Moon needed medical illustrators. He wanted to build up a visual reference library of the various ulcers he had to treat, and was fortunate to find a number of talented artists amongst his fellow prisoners. He also wanted to record the living conditions of the prisoners, and their ingenuity in improvising medical equipment from limited materials. Camp guards strictly forbade making these drawings. Moon and his artists had to steal materials including toilet paper, and posted lookouts while the drawings were being made. Some of the prisoners in the Japanese labour camps who made drawings and paintings in secret used their own hair to make paintbrushes. When the Japanese moved Moon from the camp at Tamuang, he secretly buried the collected drawings under his hut, in a tin box with poison to protect them from rats. After the war he returned to find that the huts had been destroyed. After some searching, he found the buried drawings, which are now housed in the State Library of Victoria.